When security firm Zimperium discovered Android's biggest security risk in years, it sent shock waves through the ecosystem. As a result, Google, LG, and even Samsung decided to change the way they issue updates to their devices, by pledging to release monthly security patches to plug up loopholes exactly like this one. Yeah, it's that big of a deal. Since over 99% of Android devices were vulnerable to this so-called Stagefright exploit, updates to text messaging clients and device firmware were rushed out as quickly as possible. But the majority of users are still susceptible to this particular attack, which would allow hackers to silently assume total control over your phone. The Stagefright exploit works by embedding malicious code into a media file, which can be sent to your device in a number of ways, including MMS messages. Many text messaging apps have recently been updated to block this vulnerability, so the first step you should take would be checking the Google Play Store for any app updates. But even when you're sure your apps are all up-to-date, you may still be vulnerable to one of the 6 different variants of this exploit. Luckily, though, Zimperium has released an app that will check your device for susceptibility to all variants of this attack, and it can be downloaded from the Play Store at this link. Once you've installed the app, go ahead and open it up, then hit the "Begin Analysis" button. From here, the app will check your device for any of the 6 vulnerabilities, then give you a report on its findings. 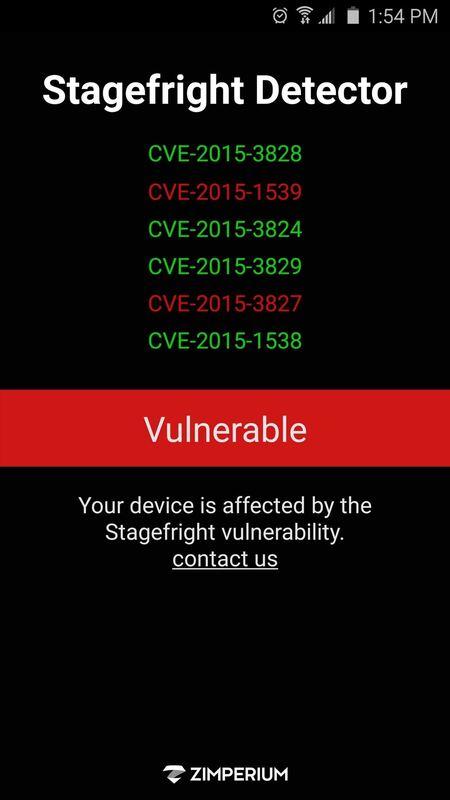 A report of "Vulnerable" means your device is still susceptible to at least one of the Stagefright exploits, and the specific vulnerability will be listed in red. If your device is listed as vulnerable, you should understand that this is a very serious bug that could cause you to fall victim to identity theft or fraud. 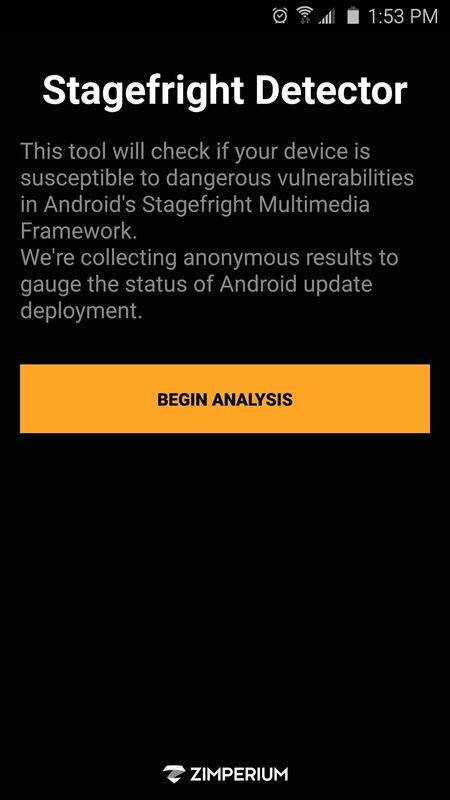 If this is the case, the best course of action would be to go through the steps of protecting yourself against Stagefright attacks, and at the very least, keep checking your device for firmware and app updates. Is your device vulnerable, or have updates fixed the issue already? Let us know in the comment section below, or drop us a line on Android Hacks' Facebook or Twitter, or Gadget Hacks' Facebook, Google+, or Twitter.